Their healing benefits are the same. However, they work very differently in recipes. Gelatin gels, just like its name. So, this is the secret ingredient used to make things like jello, gummy candies, and the gelatin eggs used in AIP baking. 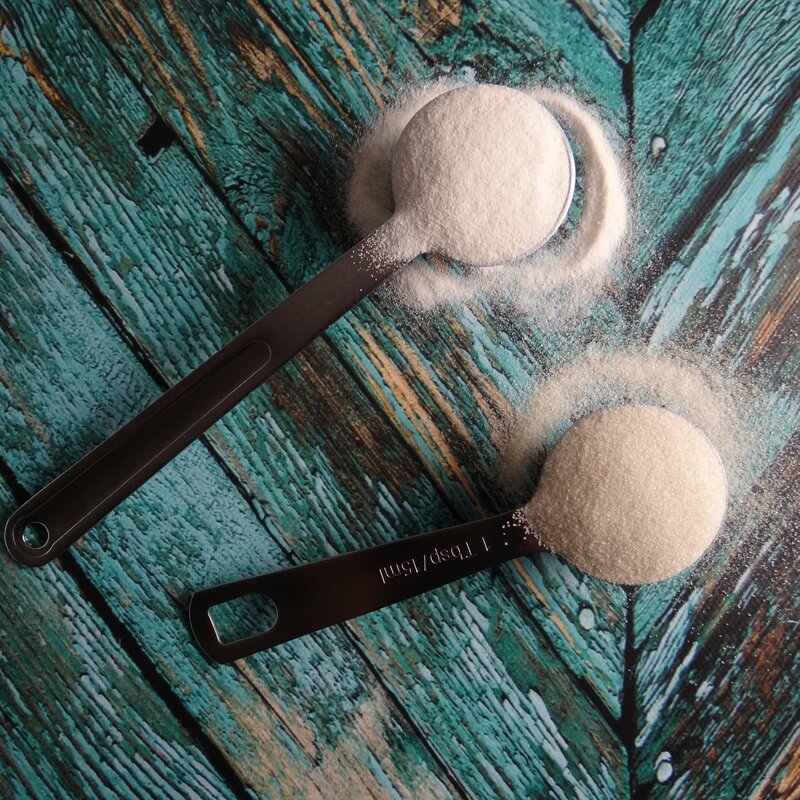 Collagen powder has been specially formulated to dissolve in liquid. This makes it an ideal supplement, because it's flavorless and can be added to anything: tea, soup, smoothies, and more. Collagen and gelatin powders have more in common than not. They're both made up of collagen and contain all the same amino acids. Collagen is the main structural protein in the body. It's most abundant in skin, tendons, and ligaments, but it's also an essential building block for the intestinal lining, intervertebral discs, blood vessels, muscles, bones, organs, eyes, hair, teeth, and more. Our body produces it naturally, but that production slows down as we age. Collagen also plays a big role in healing, which is one of the reasons it's recommended on a healing diet. How collagen and gelatin supplements are made: Animal hides are cleaned, soaked, and boiled to extract the collagen from the skin (and sometimes bones). What remains is reduced into the powder we know as gelatin. 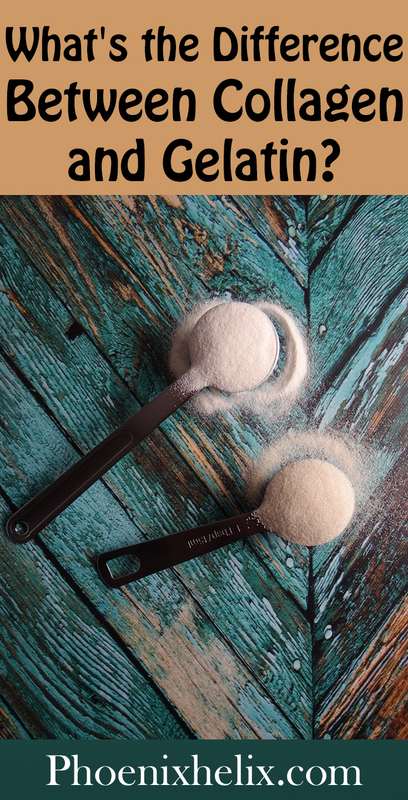 Collagen powder goes through a second step called hydrolysis, which is an enzyme treatment that allows the collagen to dissolve in water without gelling. This step also “pre-digests” the protein, by breaking it down into smaller molecules called peptides. Ethics and nutrition: Part of being an ethical omnivore is honoring the sacrifice of the animal by eating the entire animal, nose to tail. In modern life, the most nutritious parts of the animal are the parts often considered “left over” and rarely eaten: the organ meats, and the skin and bones (from which collagen and gelatin are made). As I mentioned above, collagen is a primary building block for all the structures of our body. Supplementation helps support healthy skin, nails, hair, bones, joints, teeth, organ function, eyesight, and perhaps most important of all: gut health. Collagen and gelatin help heal leaky gut. Leaky gut is linked with autoimmune disease, and it's a condition that allows molecules to slip into our bloodstream that shouldn't. This increases the autoimmune response and ramps up inflammation bodywide. The cells of our intestinal lining use gelatin and collagen to repair and regenerate. This helps seal leaky gut, and in so doing, improves not only gut health but autoimmune health at the same time. Collagen and gelatin contain the magic of proline and glycine. These are considered “conditionally essential” amino acids. This means that our body makes them, but during times of illness and stress we need more than our body can make. Autoimmune disease is a perfect example. Not only do proline and glycine provide building blocks for all the connective tissues mentioned above, they also play an important role in brain function, heart health, blood sugar regulation, detoxification, digestion, and wound repair. Most cuts of meat and seafood only contain very small amounts. Collagen and gelatin are the richest source. Are Collagen and Gelatin Powders Complete Proteins? No. They're not equivalent to a serving of meat or seafood. A complete protein is comprised of the 9 essential amino acids that our body cannot synthesize on its own and therefore must get through diet. Meat and seafood contain all nine of these, whereas collagen and protein powders are missing some. However, they contain nutrition that other forms of meat and seafood don't. As I mentioned above, collagen and gelatin are rich sources of proline and glycine. 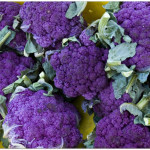 Not only do they have healing properties themselves, but our bodies function best when our amino acids are in balance. For example, most cuts of meat are rich in methionine. It's an essential amino acid that our body needs, but when we have too much methionine and not enough glycine, this can lead to health problems. Eating the whole animal isn't just good for the animal and the environment, it's also what's best for us. 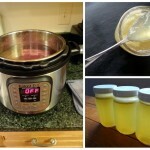 How Do They Differ From Bone Broth? Bone broth is a whole food that contains collagen and gelatin in varying amounts, depending on the bones used. For example, marrow bone broth will have low amounts (but still be high in other nutrients), whereas bone broth made with oxtail or chicken feet will have high amounts. This is because there is more collagen and gelatin found in skin and cartilage than there is in hard bone. Because bone broth is a whole food, it also contains many other healing ingredients beyond collagen and gelatin, such as bone marrow, hyaluronic acid, chondroitin sulfate, calcium, phosphorus, magnesium, and potassium, to name a few. There's a reason we crave broth when we're sick. It's a food that naturally contains a diverse array of nutrients. Collagen and gelatin powders are a concentrated supply of a specific healing ingredient. I don't see them as a replacement for bone broth, but rather an addition. In fact, some people add a little gelatin powder to their bone broth to increase the ratio of that nutrient if they're cooking with hard bones. So, continue to make bone broth a foundation of your healing diet, but if you would like to try supplementing with additional gelatin and/or collagen, pay attention and see if you notice improvements. Knox is the original gelatin, and it's the one my mother used when I was growing up. But Knox is made from conventionally raised pigs and might have traces of unhealthy ingredients mixed in with the healthy ones. Since this is a health supplement, I recommend seeking out products made from 100% grass-fed animals instead. Two companies I like are Great Lakes and Vital Proteins. Great Lakes has been around since 1922. Vital Proteins is a newer company. The quality between the two is equal. Great Lakes sources their kosher products from 100% grass-fed beef in Argentina and Brazil. Vital Proteins sources theirs from 100% grass-fed beef raised in Brazil. They both follow animal welfare guidelines, and they both use third-party testing to ensure their products are free of contaminants. 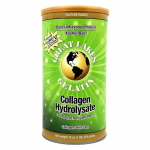 The names of their collagen supplements differ (Great Lakes calls theirs “collagen hydrolysate” and Vital Proteins calls theirs “collagen peptides”), but they are the same thing. 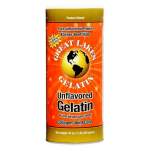 The only caution is that Great Lakes does sell a conventional pork gelatin that I don't recommend. The links above and below are to their kosher line which is grass-fed. If you're shopping on Amazon or your local health food store, look for the kosher label on the canisters. These are one of my favorite collagen-based snacks. Made from a short list of ingredients, they have a small amount of honey – just enough to satisfy a sweet tooth without setting off cravings. Their primary ingredients are healthy fats in the form of coconut and plenty of collagen, to make them satiating. 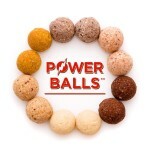 I take these Power Balls with me when I travel, and they're a great energy boost on a hike. 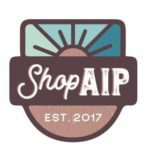 There's always a disclaimer in place on this website, but when an article mentions medications or supplements, I feel it needs repeating. I am neither a doctor nor a nutritionist, so this article isn't a substitute for medical advice. 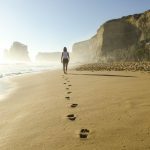 I'm simply a woman trying to maximize her own health and sharing what I learn along the way. When it comes to health troubleshooting, always work with a professional. You can find a list of practitioner directories here.